Happy New Year, everybody! Thanks for continuing to geek out with me in 2008. 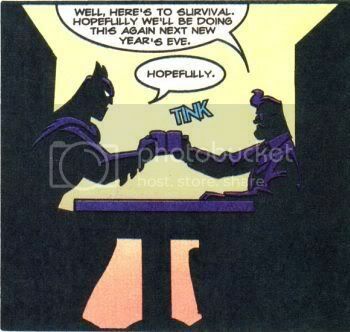 Thanks to Geekanerd for pointing to this great image from the Batman Adventures Holiday Special. It’s bad when your skin goes from pale to translucent, right? 9) Stop gushing about the return of Jericho. …on Tuesday, February 12 at 10pm ET/PT, on your favorite CBS station. 8) Get my own Xbox 360. Inviting yourself to your friend’s house to play with his toys is a habit best left to ten-year-olds. 7) Find a better photo of myself for online profiles, including my About page. In my current pic, it looks like I’ve just been informed that I’ve been selected to lead a mission to search for mutant Mole Men in the underground tunnels of New York. Intrigued, yet concerned. 6) Stop using the Lord’s name in vain, no matter how lame Hollywood’s latest ‘remake’ project is. And, again, without a costume. I’ll leave that to the professionals. 4) Continue regular series like Geeky Cake of the Week, Advice for…, and geeky Top Five… lists. I’ll run those gravy trains into the ground, believe you me. 3) Kick off new regular series like Geeky Tattoo of the Week and Battle of the Redundant Geek Movies. Because I’m all about staying fresh. Usually in the ‘insolently cheeky’ sense of the word, but you know what I mean. 2) Finish the uber-post I’ve been working on for months. I’ll give you two hints: 1) Smallville and 2) medical school. Can you guess what it’s about? Yeah, you’re wrong. Anyway, you’re going to love it. 1) Get Kristen Bell to visit the blog. You heard me. In the spirit of the blog that was created to attract a visit from Kevin Costner (eh? ), I’m going to post semi-regular appeals to my favorite geek-genre celebrity to send a pic of herself visiting this here blog. Darth Vader in 2007, why not the charming and talented Kristen Bell in 2008? Perhaps through the magic of six degrees of separation and the miracle of the internet tubes, it just might happen. I’ve got a good feeling. Everyone’s got to have goals, people. “Seeing every single IMAX release” just isn’t enough any more. So that’s it for me. What geeky resolutions have you made for yourselves for 2008? So is Kristen Bell for you sort of like Oprah was for David Letterman for all those years? Also regarding the geeky movie match-ups: did I just affect a change in public policy? Word! 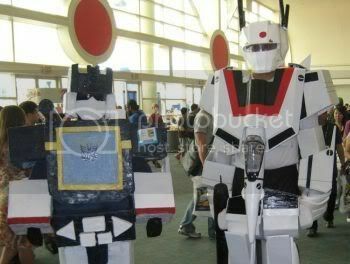 I’m going to Comic-Con this year! And I, too, will be sans costume. we’ve definitely gotta meet up! Animate something JUST FOR ME. I still have a laser scan of Rebecca Romijn from X2, I think I’ll start there.